INDIANAPOLIS – The first half of the Colts’ 2016 season ended in similar fashion to what has witnessed for the first eight games. The same issues that have had the Colts under .500 for the entire season continued in Sunday’s 30-14 loss to the Chiefs. Now, starting the second half of the season next week, the Colts (3-5) will head to Green Bay (4-3) for a 4:25 p.m. kick on Sunday. SAME SCRIPT – If the Colts want to salvage their season, what we saw in the first half of 2016 cannot be the norm in November and December. Sunday the Colts continued to beat themselves with untimely penalties, dropped passes and a lack of offensive rhythm leading to a 30-14 loss. CAN’T GET HILTON GOING – It’s a stat line you hardly ever see out of T.Y. Hilton: 1 catch in 6 targets. A hamstring injury clearly limited Hilton on Sunday. The Colts could not get their Pro Bowl receiver going with Andrew Luck misfiring all afternoon in the direction of his favorite target. LUCK’S RARE 2016 TURNOVERS – The type of critical turnovers Andrew Luck had largely avoided through the first half of 2016 appeared on Sunday. A mishandled snap and a late first half interception from Luck on Sunday contributed to the early hole for the Colts. It was rare to see Luck off on Sunday, considering how well he played last week in Nashville. OFFENSIVE LINE STRUGGLES – While the individual play of Luck wasn’t his usual self on Sunday, the protection around him did not help things. Luck was sacked a career-high six times (for the second time this season). Kansas City’s defense had just eight sacks through six games coming into Sunday, but an early lead allowed them to sack Luck four times in the second half. GREEN BAY WAITING – The Colts (3-5) will travel to Green Bay (4-3) next Sunday before their bye week. Packers quarterback Aaron Rodgers is one of the hottest QBs in the league. Rodgers threw for four touchdowns and zero interceptions on Sunday. The Colts will head to Green Bay a full two games behind the Texans (5-3) in the AFC South. INDIANAPOLIS – One week after letting one get away in Houston, the Colts flipped the script in Nashville. Making the necessary plays late, the Colts (3-4) got a much-needed 34-26 road victory over the Titans (3-4). The Colts (3-4) will now head back to Lucas Oil Stadium for a Sunday afternoon matchup with the Kansas City Chiefs (4-2) in Week Eight. HAD TO HAVE IT – The alternative on Sunday would have put the Colts in an extremely unfavorable position within the AFC South. For meaningful football to be part of this team’s 2016 finish, the Colts needed to be on the right side of the scoreboard Sunday. They were, thanks to 34-26 victory over the Titans, marking the team’s 10th straight win they’ve had over Tennessee. LUCK’S LEADERSHIP – These weren’t the typical pass catchers Andrew Luck was used to in a game setting. But Luck showed hardly any ill effects on Sunday. Luck was 27-of-39 against the Titans, throwing for 353 yards, three touchdowns and no interceptions. A 123.1 passer rating for Luck was the fifth highest of his career. FINISHING IT OFF – Down 23-20 midway through Sunday’s fourth quarter, the Colts were back in a place they’ve found themselves every week this season. Could they finish? They did. First was a 12-play touchdown drive, with Luck finding Jack Doyle on a third-and-goal from the seven-yard line. Next up was T.Y. McGill stripping Marcus Mariota and Robert Mathis returning the fumble 14 yards for the game-clinching touchdown. VINNY’S NEXT RECORD – Adam Vinatieri knocked home two field goals on Sunday, giving him an NFL record 43 straight makes. Vinny received a game ball after Sunday’s victory as he put another brick on an already very sturdy Hall of Fame resume. TIME TO BUILD – The Colts will head back home to close out the first half of 2016. Sitting at 3-4, the Colts will have two more games before their bye week (Kansas City, at Green Bay). The Colts won’t see the AFC South foes for a while. Starting on Nov. 20, the Colts will have three home divisional games to close out the season. The Indianapolis Colts today claimed outside linebacker Lavar Edwards off waivers and waived cornerback Darryl Morris. Edwards, 6-4, 275 pounds, played in five games for the Carolina Panthers this season before being waived on October 18. He has seen action in 17 career NFL games (one start) and tallied 17 tackles (11 solo), 1.0 sack and two passes defensed in his time with the Panthers (2016), Chicago Bears (2015), Dallas Cowboys (2014) and Tennessee Titans (2013). Edwards was originally selected by the Titans in the fifth round (142nd overall) of the 2013 NFL Draft out of LSU. In 2016, Edwards played in five games for the Panthers and registered seven tackles (five solo), 1.0 sack and one pass defensed. He was signed to the Buffalo Bills active roster and spent the last five weeks of the 2015 regular season with the team but did not see any game action. Edwards spent most of the 2015 season on the Cowboys practice squad after appearing in one game with the Bears. He also spent time with the Oakland Raiders. In 2014, Edwards spent time on the Cowboys active roster and practice squad. He saw action in four games for Dallas and tallied one solo tackle. Edwards played in seven games (one start) as a rookie in 2013 and finished with nine tackles (five solo) and one pass defensed. Morris, 5-10, 188 pounds, was signed by the Colts as a free agent on September 5, 2016. He played in all six games (one start) for Indianapolis this season and compiled 15 tackles (14 solo), one pass defensed and one special teams stop. Morris has seen action in 42 career NFL games (two starts) and totaled 54 tackles (45 solo), seven passes defensed, one interception and one special teams stop. The Indianapolis Colts today signed defensive tackle Kelcy Quarles to the practice squad. Quarles, 6-4, 310 pounds, spent time on the Colts practice squad earlier this season. He participated in the Colts 2016 offseason program and training camp before being waived during final cuts on September 3. Quarles was signed to the team’s practice squad on September 4 and released on September 13. Last season, he was signed to the Colts active roster from the team’s practice squad on December 21, 2015. Quarles has played in two career NFL games and recorded one tackle, 1.0 sack and one pass defensed. He has previously spent time on the practice squads of the New England Patriots (2014-15) and the Cleveland Browns (2015). The Indianapolis Colts today elevated wide receiver Tevaun Smith to the 53-man roster from the practice squad. The team signed wide receiver Marcus Leak and cornerback Frankie Williams to the practice squad. The Colts also placed wide receiver Quan Bray on the Injured Reserve list and tight end Mike Miller on the practice squad Injured Reserve list. Safety Lee Hightower was released from the practice squad. Smith, 6-2, 205 pounds, has spent the entire season on the Colts practice squad after signing with the team on May 2, 2016. He participated in Indianapolis’ 2016 offseason program and training camp after originally signing with the team as an undrafted free agent on May 2, 2016. Collegiately, Smith totaled 102 catches for 1,500 yards (14.7 avg.) and seven touchdowns in 47 career games (24 starts) at Iowa. He saw action in 12 games (10 starts) as a senior in 2015, finishing second on the team in receiving yards (563) and third in receptions (32). Smith also had three touchdowns. He earned Honorable Mention All-Big Ten honors from the league’s coaches after playing in 13 games (eight starts) as a junior in 2014, finishing the year with 43 catches for 596 yards and three touchdowns. Smith’s 596 receiving yards led the team and his 43 receptions ranked second. Leak, 6-0, 210 pounds, participated in the Colts 2016 offseason program and training camp before being waived on August 22. He originally signed with Indianapolis as an undrafted free agent on May 2, 2016. In three seasons at the University of Maryland, Leak played in 27 games (16 starts) and totaled 55 receptions for 775 yards and six touchdowns. In 2014, he posted 20 catches for 297 yards and three touchdowns, including a two-touchdown game against South Florida. Leak recorded a career-high 94 receiving yards in a 2012 contest against North Carolina State, which included a career-long reception of 47 yards. Williams, 5-9, 190 pounds, was elevated to the Colts’ 53-man roster from the practice squad on October 13, 2016 and saw action in Indianapolis’ Week 6 loss at Houston. He was waived by the team on October 17. Williams spent Weeks 1-5 on the Colts practice squad. He participated in the Colts 2016 offseason program and training camp before being waived on September 5. Williams originally signed with the Colts as an undrafted free agent on May 7, 2016. Collegiately, he played in 48 games (38 starts) at Purdue and totaled 227 tackles (163 solo), 5.5 tackles for loss, 1.5 sacks, two fumble recoveries, one forced fumble, 36 passes defensed, 10 interceptions (one returned for a touchdown) and one blocked kick. Bray, 5-10, 186 pounds, played in all six games for the Colts this season and registered nine kickoff returns for 231 yards (25.7 avg.) and seven punt returns for 58 yards (8.3 avg.). He also caught three passes for 36 yards and had one carry for seven yards. Bray spent time on the Colts active roster and practice squad as a rookie in 2015 after originally signing with the team as an undrafted free agent on May 5, 2015. Miller, 6-6, 255 pounds, has spent the entire season on the Colts practice squad after signing with the team on September 4, 2016. He participated in Indianapolis’ 2016 offseason program and training camp. Miller originally signed with the Colts as an undrafted free agent on May 2, 2016. Collegiately, he played in 27 games (20 starts) at Taylor University and finished his career with 80 receptions for 959 yards and seven touchdowns after transferring following two seasons at Santa Monica College in California. Hightower, 6-2, 200 pounds, has spent five weeks on the Colts practice squad this season. He was most recently signed by the team on October 4, 2016. 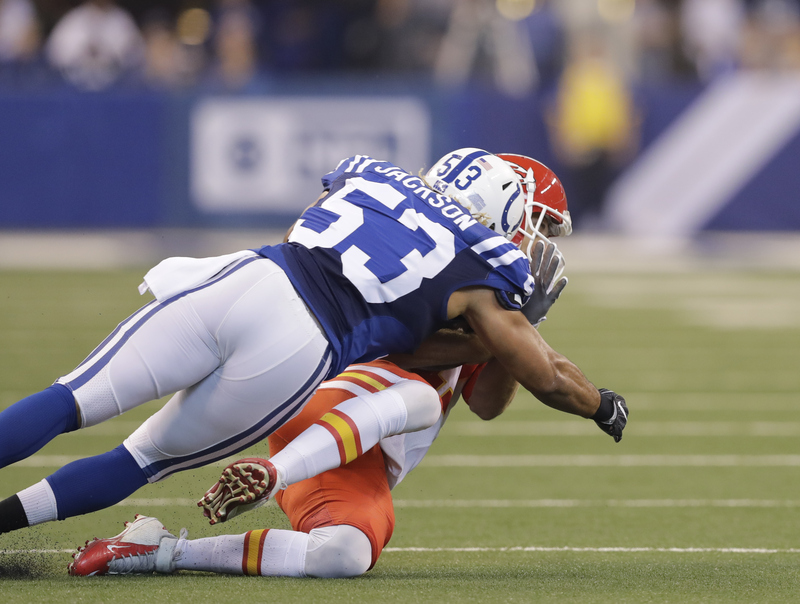 Hightower spent time with Indianapolis during the 2016 offseason program and training camp before being waived during final cuts on September 3. Collegiately, he played in 20 games (seven starts) in two seasons (2014-15) at the University of Houston and finished with 65 tackles (40 solo), 0.5 tackles for loss, two interceptions, five passes defensed and one forced fumble. Prior to transferring to Houston, Hightower started 11-of-15 games at Boise State from 2011-12 and registered 56 tackles, 4.0 tackles for loss, one interception and five passes defensed. The Indianapolis Colts today signed free agent tight end Chase Coffman. Coffman, 6-6, 250 pounds, was originally signed by the Colts as a free agent on July 26, 2016. He participated in training camp with the team before being released on September 4. Coffman has played in 37 career NFL games (three starts) and caught 18 passes for 177 yards and two touchdowns in his time with the Seattle Seahawks (2015), Tennessee Titans (2014-15), Atlanta Falcons (2012-13) and Cincinnati Bengals (2009-2011). He has appeared in three postseason contests and collected one reception for 16 yards.